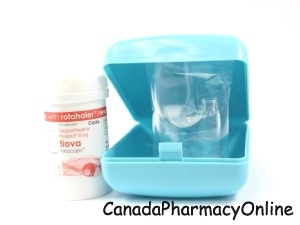 Find the best prescription drug prices and order Spiriva Tiotropium handihaler inhalation through Canada Pharmacy Online. Spiriva handihaler is a dry powder that consisting of Spiriva hard Capsules and a Handihaler device. We currently have the brand Spiriva inhalation from Canada and Turkey manufactured by Boehringer Ingelheim. The generic Tiotropium also called Tiova comes from India and is manufactured by Cipla. Spiriva handihaler is available in 18 mcg/30 blisters. Generic Tiotropium comes in rotahaler device (1 unit), Tiotropium with device of 18 mg/15 capsules. Browse through our wide selection of asthma and COPD medications and purchase Tiotropium Bromide inhalation by calling us at 1866-920-3784. Spiriva handihaler (Tiotropium inhalation powder) is a bronchodilator that is used once daily for the long term relief of symptoms such as shortness of breath and wheezing associated with the lung disease known as chronic obstructive pulmonary disease (COPD), which includes chronic bronchitis and emphysema. Tiotropium works by opening the airways for a full 24 hours to make breathing easier. This medication comes as a capsule containing dry powder, which is inhaled through the mouth using the Handihaler device. Tiotropium should not be used as a rescue medication to relieve sudden attacks of COPD symptoms such as wheezing or shortness of breath. Do not use Spiriva if you are allergic to Tiotropium or Ipratropium. Before you start using this medication, inform your doctor about all the medications you are currently taking including OTC and herbal medications. It is unknown whether Spiriva is harmful to an unborn baby. Inform your doctor if you are pregnant or plan to become pregnant during treatment. It is unknown if Tiotropium passes into breast milk or if it could harm a nursing baby. Inform your doctor if you are breast-feeding a baby. 1. Can I take Spiriva if I still smoke? Answer: Yes, you can but quitting smoking is the only thing that can actually slow down the progression of COPD but Spiriva can still help you breathe better. 2. Is it safe for me to drive while I am taking Spiriva? Answer: Spiriva Handihaler can cause dizziness and blurred vision. You should be very careful when engaging in activities such as driving or operating machinery.